Well, I know I've been behind the scenes for the last couple of days. We've been in a pickle over what to do about one of our cars. It was a '98 Neon with 169K on it. We've been replacing it one part at a time for the last year and a half. It even got a new battery and alternator just two weeks ago. But this was the last straw. The transmission started acting up, needing a swig of transmission fluid almost everyday and throwing it up in the driveway every night. NO MORE! Even though that little car served us well (it used to be mine before Eric and I were married--awww! ), just like an old horse, it was time to shoot her and put her down. Goodbye little Neon go-cart friend! And now, out of necessity, we are the proud owners of a car payment. A couple of days ago, we went car shopping and landed a deal on a 2008 light blue Hyundai Sonata. It took ALL DAY LONG and I haggled the price to the penny (it was kind of fun, actually)!! The best thing? The air conditioner even works! I'm so happy for Eric to have a nice ride (and a little jealous at the same time, but I know I'll still get to drive it--my name's on the title, too!). Anyway, it's Saturday and time for Jen's Sketch For You To Try! As I was thinking about the phrase "shooting her and putting her down" and really saying it to myself in a hard Texas drawl, it reminded me of this little cowgirl from Whipper Snapper and her little "tip". Can't you just hear her saying it in Texan? (That's with a twang, ya'll.) 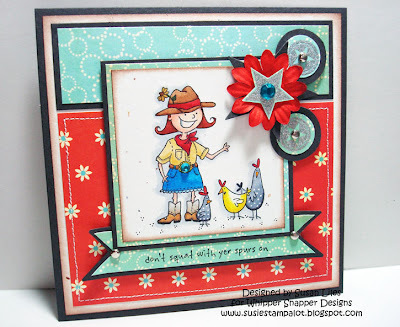 She's from one of Anna's newly released stamp sets called Cowgirl Up! I love love love Anna's chickens and this set has a few included, so I just had to include some of them. I made the little circle embellishments from a couple of the other stamps in the set as well and heat embossed them in silver. So today, Jen is teaching a couple of Copic classes at the Scrapper's Boutique here in North Richland Hills and I'm going to go sit in on it just for fun. My mom and my sister, Nancy will be there and it's going to be a fun day. Maybe I'll take the new car and open up the sunroof for the drive over! Hello my new foreign friend. 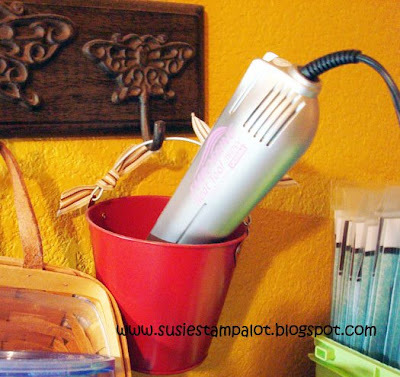 SUSIE Q-TIP: If you keep your heat tool in a metal bucket, you can just chuck it right in there even after you use it and not have to worry about it burning anything. 2.) Your card is SO adorable. I love it. You rock... have I mentioned that lately? Hugs and have a great day, Susan! Congrats on the new car! We had a 2000 Neon and it did the same thing! We replaced part after part until enough was enough! Now we, too are the proud owners of a car payment. But with that comes air conditioner that works ALL the time! :) Which is a necessity in this almost 100 degree weather!! How cute is this? I love the paper choices and you colored the image perfectly! Such a fun design! TFs and good luck with the car issues!!! How cute, cute, cute!!! Enjoy your new car! Have a fun day at Jen's class, too! Wish I could join you! Love the sentiment on the card! Gave me a good laugh :D Cute image and card too. YUCK about the car payment, but YAY for a/c! Love the card! HOORAY and NOT hooray!!!! NO MORE NEON but no you get a car payment...YUCK!!!!! Since you did the haggling, I say you should get to drive it whenever you want!!!!!!!! !